Max Lamb used waste cotton and wool to create 12 benches for a Milan design week installation that aims to challenge the architecture and design industries to rethink their use of resources. The British designer created the pieces for Really, a brand that upcycles end-of-life textiles into solid textile boards. Presented during this year's Milan design week, Lamb's pieces mark the company's debut collection and follow on from a majority acquisition by Danish textile brand Kvadrat. 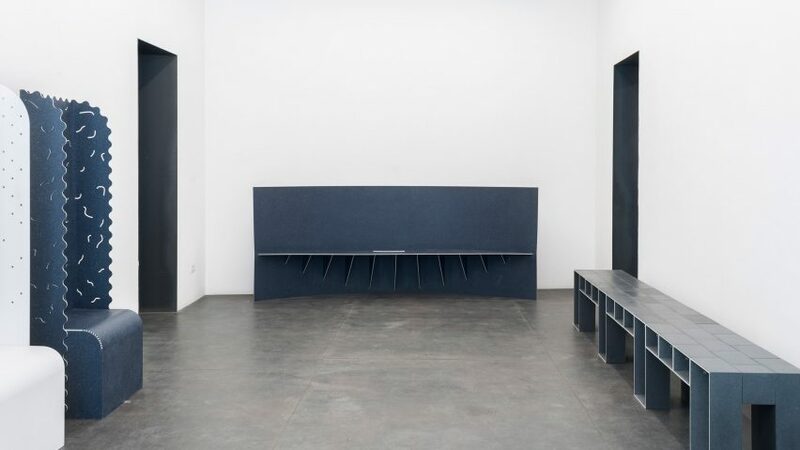 Known for his material experimentation, Lamb produced 12 benches that each show the different potentials of the solid textile board – which he described as having a warmth thanks to its textile makeup. "It is an intriguing material: at first you don't quite know what it is made of, but once you know it is made out of textiles it makes sense," he said. "There is a warmth that comes from its textiles origins." Togther, each of the 12 benches form a colour palette of whites and navies. Some feature cut-out squiggles, while others are robust and blocky. Lamb's benches are exhibited alongside a photography project by Christien Meindertsma named A Single Sample, in which she shows how remnants of tea towels, sheets and dish cloths are transformed into one board. Curator Jane Withers described the show as being "as much about asking questions as presenting material answers". "The two commissions – by Christien Meindertsma and Max Lamb – are designed not simply to showcase the properties of a new material made from a familiar old one, but also to start a dialogue about the shift in perception, processes and logistics needed as we grapple with upcycling waste," she said. Really has patented the process for creating its solid textile boards, which involves milling used textiles into small fibres and mixing them with a special binder that doesn't degenerate through reuse. As the textiles being used are coloured already, the company forgoes dying. The process also doesn't require additional water and chemicals to be added. The board can eventually be regranulated and formed into new material. Lamb's installation for Really is on show until 9 April at Via Pietro Maroncelli 7 as part of this year's Milan design week. Other happenings across the city include a bubble-blowing tree and an exhibition that blurs the boundaries between art and design.